Chandrashila is the best family adventure trekking on a hilly terrain, which is neither hard or tough. The people joining this adventure has no restriction on age ; only the determination and everything ability to cope up with this air is required. At an altitude of more than 12500 metres flaunts the Chopta Chandrashila trek. The journey is accommodating in the regular trekking seasons,which is in the month of April to November.The elements of trek:- the Himalayas, lakes, temple, beauty of the valley and meadows. Once Delhi is left behind and you continue your journey from Haridwar to Rishikesh along with Okhimath the real adventure begins, the anticipation of the excitement keep the trekkers up. Deoriya taal:- Is the best perfect camping site at an high altitude,which is the main attraction points for Chopta Chandrashila of family trekking tour. 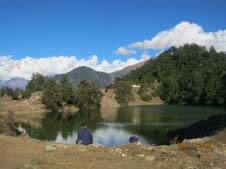 Valley of Chopta:- It is second on the list for perfect camping sit. This valley of Chopta flourishly green and vibrant colour in summers and in winter season you can see the soft layer of snow all over giving an awesome view to this valley. Tungnath temple:- This trek is incomplete without paying a visit to Tungnath temple. This temple is dedicated to Lord Shiva, any many tourists and pilgrims pray here, it is at the highest point Lord Shiva temple. Following the route, you reach to Chandrashila summit which act as a base who wish to climb peak expedition. The magical grip of bond of relationship and nature both come alive here for 8 days.Don't miss to be the part of it! After an early breakfast trek to Tungnath ,Chandrashila. Tungnath is situated at the height of 3680 mts. Upon arrival at Tungnath Temple and visit the temple. After relax one furth er 1 kms trek to Chandrasila peak. Later trek back to Alpine Camp( Duggalbitta) for dinner and overnight stay. Or Back to your next journey.